I’m not going to talk much about the offer sheet that Nashville Predators’ defenseman signed with the Philadelphia Flyers late last night. I don’t know if the Predators will match, I don’t care if it’s a particularly good deal or not. The thing that interests me is that, prior to the offer sheet being signed, the Red Wings were attempting to trade for Weber. Honestly, I just do not understand why. The Predators have a legitimate rivalry with the Red Wings now. With both teams having lost key pieces of their blue line this summer, Nashville was not going to deal their captain and one of the top defensement in the league to Detroit without a king’s ransom going the other way in return. I find it hard to believe that whatever it would have taken for the Wings to pry Weber’s rights away from the Preds would have been worth less to Detroit than the four first-round draft picks that would go to Nashville as compensation for signing Weber away. As we hear time and time again, teams know the Wings need defensive help and are trying to bend them over the barrel in trades. The Wings had the chance to do what the Flyers did. They didn’t need to play nice with Nashville and work out a deal. They could have just signed Weber and forfeited the picks. I didn’t expect Weber to end up in Detroit this summer (or next, for that matter) so I don’t see this as a big loss for the Wings. I’m just shocked (and somewhat annoyed) that the team’s front office seemingly ignored the offer sheet option if they really wanted to acquire him. As reported first by TSN’s Darren Dreger, the Detroit Red Wings agreed to terms with defenseman Kyle Quincey on a two-year contract on Wednesday. As per club policy, financial terms of the deal were not officially announced. The Helene St. James of the Detroit Free Press reports it’s a $7.55 million deal, which would give him a cap hit of $3.775 million. Quincey had been set to go to arbitration with the team over a contract for next season. The hearing was scheduled for July 25. With the new deal, the two sides avoid the arbitration process. The Red Wings acquired Quincey in a three-team deal with the Colorado Avalanche and Tampa Bay Lightning on February 21. Quincey had originally been drafted by the Wings but was lost to the Los Angeles Kings on waivers in 2008. He was traded to the Avalanche on July 3, 2009. In 18 games to close out the season with the Red Wings, Quincey had two goals and an assist with 29 penalty minutes. He added two assists and and six penalty minutes in five playoff games. In his 257-game NHL career, Quincey has 18 goals, 77 assists and 250 penalty minutes. 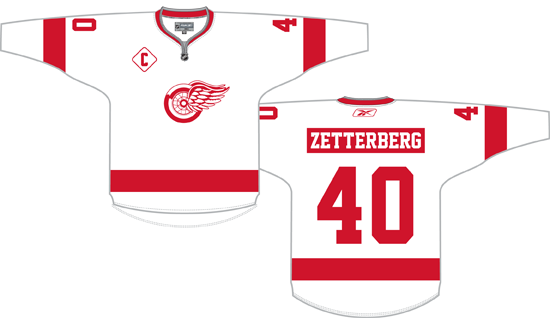 Things are mostly quiet in the Red Wings’ world so shall we take a look at another possible jersey for the 2013 Winter Classic? After four ideas that stuck to the current rule of the home team wearing a dark jersey, I’m getting away from that on this one and going with a design based on the white jersey created in 1934 to wear against the Montreal Canadiens, who also wore red. As I mentioned when I published my concept based on the 1932 red jerseys, I’ve seen a lot of feedback calling for the old-school Winged Wheel to be featured on the Wings’ Winter Classic jerseys. This keeps that in mind while also going in a slightly different direction. To me, the pre-1961 jerseys just scream “old time hockey.” It’s probably because they’re recognizable as being a precursor of the current sweaters while still being relatively different, as the current red sleeves weren’t in use yet. Again, as with the 1932-based concept, I’ve added modern elements such as sleeve numbers and a nameplate. I avoided the trend of using “vintage white” because I personally think that looks awful on a white-based jersey. I don’t see the Wings escaping all of the current vintage trends, though, which is why I went with the opposite-colored nameplate. As with my previous designs, I would expect this design to include a lace-up collar, I just don’t have a template that can show it. I placed the captain’s C in a rounded diamond with a white background because that was the modernization that the Red Wings used in 1991-92. No, I don’t have any official word on Henrik Zetterberg being given the C, I just don’t see it going to anyone else. Unlike my other ideas, I really don’t think this one is likely to be worn. As I said off the top, I had to go against the current dark-at-home rule and, while Buffalo did wear white in the initial Winter Classic, I don’t see the Red Wings doing the same. The Detroit Red Wings announced on Thursday the hiring of Tom Renney as associate coach. Renney replaces Jeff Blashill, who took over as head coach of the Grand Rapids Griffins last week. Most recently the head coach of the Edmonton Oilers, Renney has also served as the head coach of the Vancouver Canucks, assistant and head coach of the New York Rangers, and associate coach in Edmonton. The Oilers did not make the playoffs in two seasons under Renney, leading to his replacement this summer. So far since the NHL’s free agency season opened, we’ve had a day where the Wings brought players in, a day where players left Detroit, and a day when the team was quiet. Today we had the day the team was left out. Things started with defenseman Ryan Suter and forward Zach Parise – both Red Wings’ free agent targets – choosing to sign with the Minnesota Wild around noon. About ten hours later, Detroit’s supposed Plan B – defensman Matt Carle – signed with the Tampa Bay Lightning. I’m not going to fault any of the players for signing where they did or taking the time they needed to sign. You become one of the top hockey players in the world and hit free agency, you get to decide things like that. I’m not happy with the Wings’ organization, however. I said on Twitter that I didn’t like comments that GM Ken Holland made after the Suter/Parise signings were announced. To me, that sounds like Holland is fine being close but not finishing on top, which sounds a lot like when Mike Babcock talks about winning forty minutes of a game after a loss. It’s easy to look at the deals that Parise and Suter signed and say Minnesota overpaid. It’s also easy to extend that and say we wouldn’t have liked Holland making those deals. I don’t think it’s true, though. I think Wings fans would have been thrilled to have the pair for that price and we’re only shaking our heads at the amount or the term because it’s another team that spent it. That means that we’ve got something like a top pair of Niklas Kronwall and Kyle Quincey with Ian White and Brendan Smith next and Jonathan Ericsson and Jakub Kindl on the third pair. Quite honestly, I’m not okay with that. Maybe I’m spoiled but I expect better from this team. And something tells me that if the Wings roll into the 2012-13 season with a $60 million payroll instead of the expected $70 million, season ticket holders won’t be getting 1/7th of what they paid back. The summer isn’t over and the Wings aren’t done. I’m not going to write them off. The buzz now is that they’re looking to make a trade and/or sign Shane Doan, who won’t make a decision about his future until July 8th. Things could still happen for Detroit, I’m just not happy with how the organization has handled it thus far.